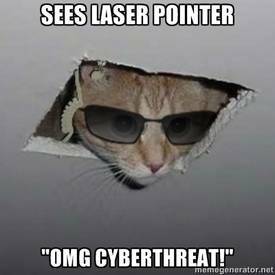 We interrupt Caturday for an important anti-CISPA announcement. | MEOW hear this! A very thoughtful post! Glad you are thinking about this issue. But with all due respect please don’t be lulled into the notion that old guys are somehow benign technology challenged dim wits. Much of the technology we think of as new today is decades old with military applications. Doing the math, I would say that makes some of the elderly you think have no teeth the developers of new world technology and our old politician the proponents of its development. They knew exactly what they were doing by signing the bill! You don’t need to know how to fix a computer to understand how to make money and rule the world! Also, I think the “law abiding citizen with nothing to hide” response is a trap – if we have nothing to hide why should we give up our privacy? Glad you are presenting your ideas and are concerned for all of us! By no means did I intend to generalize that all older people fumble around like Grandpa on the Simpsons when it comes to technology. Yes, there is much that I don’t know about what the politicians know and don’t know. Perhaps I could have worded it better if I’d pointed out that they might be out of touch with the way that it’s used. For example, law enforcement agencies were unprepared for the explosion of tweets regarding the manhunt, both from people reporting in that area and from listening to police scanners. One can know about technology but be clueless on the full scope of its power. Mostly, though, I was referring to Rep. Mike Rogers who said CISPA’s opposition was a bunch of 14-year-olds tweeting from their basements. Of course there’s more to it than just one quote, but seeing as how he authored the bill, it should make everyone step back and wonder if the people in charge really know what they’re doing. I fully agree that we shouldn’t give up our privacy just because we have nothing to hide. We’re supposed to be the standard of freedom here. What kind of message does it send if we willfully give those up? Thanks for reading! We SHOULD all be concerned. Especially in the wake of tragedies. Hence the “Patriot” Act. Great post, well written! Thank you for spreading the word. Ok, I know that it’s a though provoking subject but that really made me laugh. I haven’t seen a pager for years. It seems crazy that politicians think they could make this law without people freaking out. Maybe they should tackle some more pressing topics. Are you kidding? People are far more concerned with having their precious firearms taken away than with this. Honestly, it’s barely making the news. Depressing, huh? I should reserve my opinions about firearms, it seems like a hot topic south of the border. We don’t really understand the resistance to making things safer. Usually gun violence in Canada involves two rival gangs, drugs and turf…they’re killing each other…c’est la vie. I have very little opinion on them either way…I’m all for freedom and rights and all that but on the other hand, who needs an assault rifle to protect yourself? Frankly, I feel like I’d have much better luck with a baseball bat if someone broke into my house. My biggest reason for not having a gun? I’m pretty sure I would accidentally shoot myself with it somehow. I’m enough of a danger to myself without adding firepower. Ha, I think we’d have that in common, I’m such a klutz. A friend just bought property in Arizona and tells of people riding down the street on motorbikes with long rifles in their holsters. That’d would un-nerve me. That’s so the type, threatening a chick because you’re such a man. What a loser. I see your point though. Note to self, “don’t mix it up on the road in America” keeping saluting finger in check…HA. Hah. It usually doesn’t stop me. I will probably meet my end that way.